Nightfall at Fell's Point - Built during the Revolutionary War, Fell's Point was the original port of Baltimore. The busy waterfront community boasted over twenty shipyards and produced the world famous Baltimore Clipper Ships. 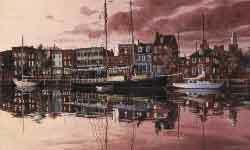 Richard has captured the heart of this historic port of call exactly as if appears today.